From Dec. 16th, thirty new artworks will replace the current exhibition in the Caldera Art Gallery. These will then be on display until Feb. 17th 2017. These new works are also visually stunning and promote the message of maintaining the integrity of the region's natural environment. All CA2016 entries may be viewed in the Caldera Art website on-line exhibition. A note to all participating artists: Please pick up unsold artworks anytime after 9th Dec and/or deliver new works anytime before 14th Dec.
A leisurely 95 km day trip to experience the Tweed's upper catchment waterways and rock formations with some spectacular views and superb picnic facilities. A full day if a visit to the Tweed Regional Gallery & Museum, Caldera Art Gallery and/or Treasures of the Tweed is included. 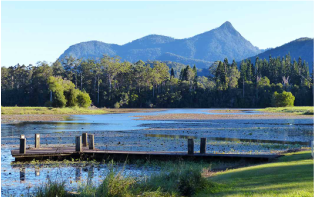 Highlights include the Clarrie Hall Dam, Crams Farm Reserve and the mighty Mt Doughboy and Mt Tarrawyra. Check it out in the PhotoTrails Pages. 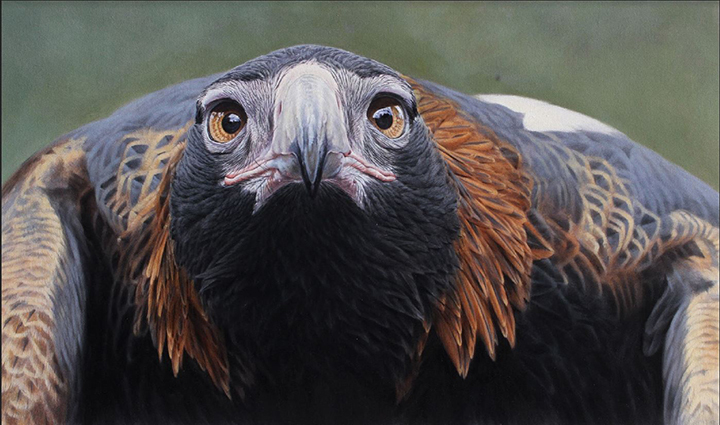 In its second year, the Holmes Acquisitive Art Prize for Excellence in Realistic Australian Bird Art showcases Australia’s best realistic bird art artists working in any two-dimensional medium and depicting a realistic Australian birdlife scene. Finalists have been selected and will be included in an exhibition at the Caloundra Regional Gallery, with a major prize of $10,000. The winning artwork will be acquired into the collection of Dr Gary Holmes. 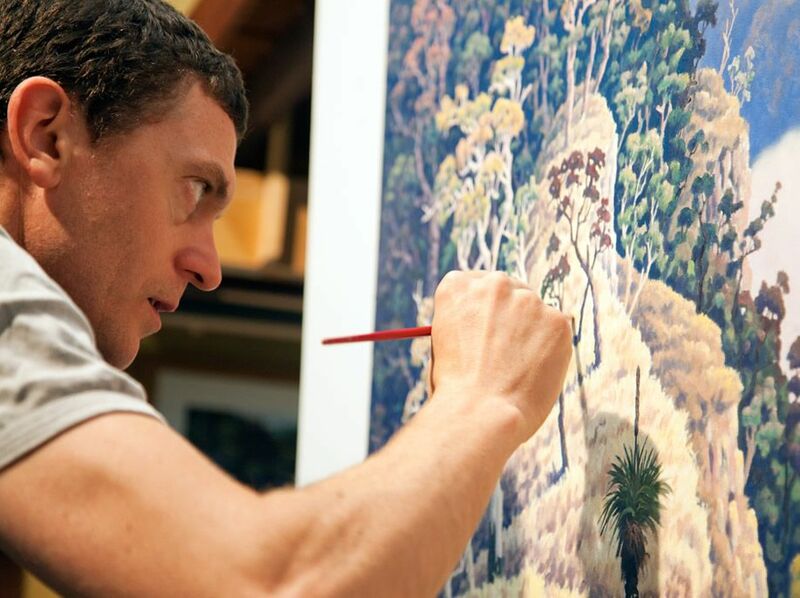 Visit the website for some outstanding artworks by some of Australia's leading bird artists. The project (2016-19) continues the long term vision to achieve connectivity of good condition vegetation corridors linking from the Tweed Coast via the coastal National Parks and Nature Reserves through to the Border Ranges and escarpment National Parks and Nature Reserves. The linkages provide habitat and movement corridors for a range of flora and fauna including threatened species and communities. Participating properties are at Numinbah, Dungay,Tomewin, Terragon and Cudgera Creek and contain the endangered ecological community Lowland Rainforest. See Page 4 of the latest Tweed Landcare News. Also, don't forget to get a copy of The Fragile Edge book. “It’s not until you see an impressive flock of native birds or that majestic rare sighting that you really appreciate how amazing birdwatching can be. 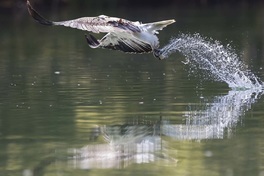 No matter which bird watching destination travellers choose, they are bound to glimpse some truly spectacular birds at inland and coastal locations across NSW,” Ms Chipchase said. To find out about NSW’s most exciting birdwatching hotspots, visit the Destination NSW website. We reckon the variety of species to be seen in the Green Cauldron is second to none. Residing west of Tyalgum, Kathryn is invariably inspired by the landscape and biodiversity of her 'backyard'. Having been involved with the Saturday morning Caldera Art Group virtually since its inception in 2009, she is one of the longest 'serving' members and her patient approach to creating artworks is an inspiration to the other artists. Please go to Kathryn's page and check out the artworks by someone who had never painted before joining the Caldera Art group. ​The Coolamon (or Duroby) is just about in full flower just outside the front entrance. This rainforest species naturally occurs only in the Green Cauldron region and is the floral emblem of the Tweed Shire. Interestingly, it's flowers emerge from the trunk and branches of the tree (rather at the end foliage stems like most trees) This unusual phenomena is known as 'cauliflory'. Also coming into full bloom in the adjoining Knox Park is the Illawara Flame Tree, very showy and a treat to see when growing in the wild....a splash of scarlet in a sea of green. The Broad-leaved Palm Lilly (Cordyline spp) has flowered and is now in full fruit... more of a splash of red in time for the festive season. "My contemporary landscapes are concerned with the mountains and valleys that surround me at Beechmont, in the Gold Coast hinterland. My family has lived in the area for four generations and I now live and work in a studio, which I built on the edge of Lamington National Park. My Grandfather, Arthur Groom established Binna Burra Lodge on the edge of the park." "I believe the best way to capture the essence of the landscape is to live in it, enabling me to observe the constantly changing forms, colours, textures and light at different times of day and to watch the processes of nature. My work is a personal journey of observing our natural landscape." 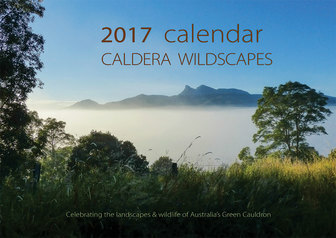 The Caldera Wildscapes 2017 calendar features images of iconic landscape locations within Australia's Green Cauldron, and stunning images of birds and rainforest. This is the first full colour calendar (one page per month) that truly showcases the natural wonders of this region. Another first for Caldera Art & Wildscapes. 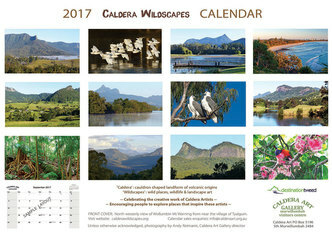 Calendar may be purchased in the CW Store page, or at the Murwillumbah Visitors Centre. ​This month's mystery Wildscape (below): What is the name of the distant mountain? What is the village in the foreground, and from which public road was the photo taken? Hint: Photo was taken from a place ear-marked by Council to become a designated lookout in 2017. ​Answers to last month's quiz (image below): Photo taken from Cram's Farm Reserve (see Doon Doon PhotoTrail), with a zoom lens looking south-west to Sphinx Rock then Mt Burrel (Nightcap National Park). 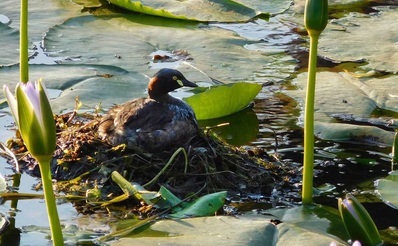 ​The answer to last month's quiz (lower right): Australasian Grebe, a relatively common waterbird on feshwater lakes and wetlands. This month's image (below left) was sent in by Sue McLeod of Myocum. 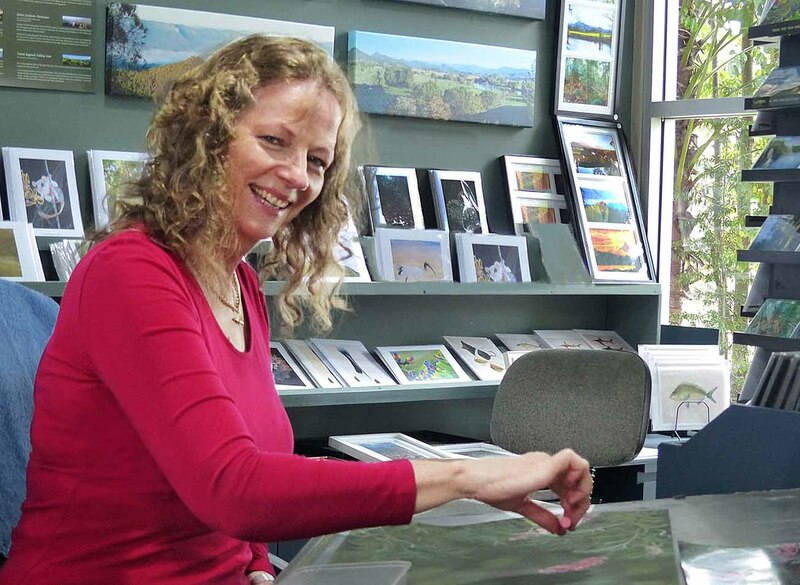 A series of colourful cards produced by artists passionate about the region's rich natural environment (rainforest plants in particular) has been produced. ​Each has a relevant story about this region and the festive season. ​Please support the work of Caldera Artists by visiting the Store page and purchasing a set or two (along with a calendar). 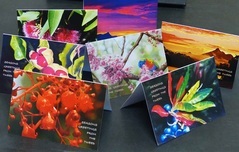 Individual cards are also available at the Murwillumbah Visitors Centre. ​See you in February, have a delightful and safe festive season, exploring Australia's Green Cauldron ...... from the artists at the Caldera Art Gallery.